Can metagenomic analyses of sewage be a usefull way of monitoring antimicorbial resistance and other infectious disease threats from larger healthy human populations? I have always dreamed of being able to perform real-time surveillance of all health issues relevant to humans and animals simultaneously in all countries in the world and to share and analyse the data freely with everybody – including the general public. For many years, my main focus has been on setting up a surveillance program for infectious diseases and specifically antimicrobial resistance. However, for practical, ethical, and legal reasons, this has proven very difficult. Not only because scientists and public health institutions are reluctant to share information, but also because they use different methods, which makes it difficult to compare data. The increased global use of next generation sequencing technologies (NGS), which provide a common language that can easily be shared electronically, has the ability to drastically change this. However, our attempts to promote rapid sharing of data from clinical isolates and metagenomics of samples obtained directly from humans have been met with a number of different practical and ethical obstacles. In an effort to overcome these obstacles, we considered whether perhaps obtaining sewage and analysing it using metagenomics would be an ethically acceptable and economically feasible approach to continuous global surveillance of pathogens and antimicrobial resistance. To test this we contacted people around the World and asked them to participate in the Global Sewage Surveillance Project. Here we present the first results based on metagenomic analysis of untreated sewage to characterize the bacterial resistome from 79 sites in 63 countries. Link to article in Nature Communications here. 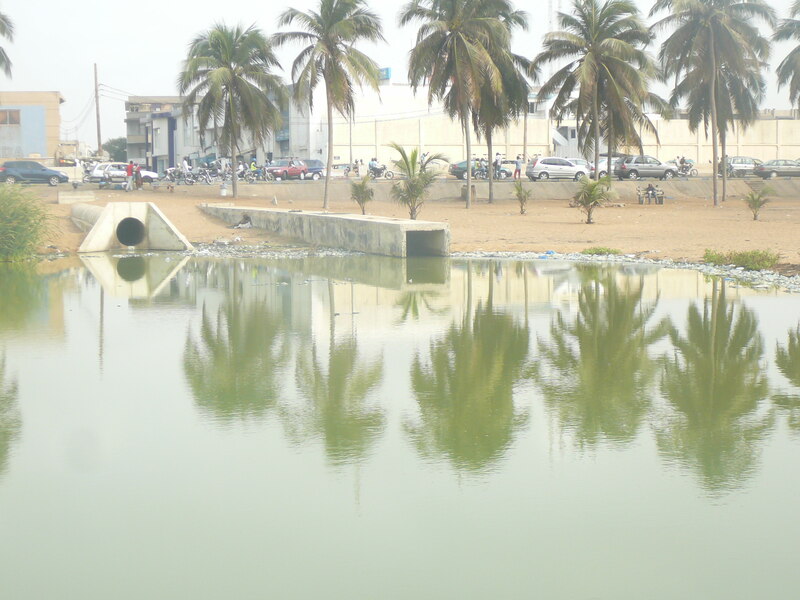 Sewage collection sites in Togo. We found systematic differences in abundance and diversity of antimicrobial resistance genes between Europe/North-America/Oceania and Africa/Asia/South-America. North America, Western Europe, Australia and New Zealand generally have the lowest levels of antimicrobial resistance, while Asia, Africa and South America have the highest levels. Brazil, India and Vietnam have the greatest diversity in resistance genes, while Australia and New Zealand have the lowest. Interestingly, we found that available data on antimicrobial use only explained a minor part of the occurrence of antimicrobial resistance in the various countries. Therefore, we looked for other epidemiological factors that might explain the geographical differences we observed. Comparing our data to data from the World Bank showed a highly significant correlation to variables, which relate to the sanitary conditions in the country and the population’s general state of health. Thus, in the fight against antimicrobial resistance, our findings suggest that it would be a very effective strategy if concerted efforts were made to improve sanitary conditions in countries with high levels of antimicrobial resistance. It was not possible to obtain sewage samples from all countries in the world – in some cases because the national authorities would not allow this. However, using the same World Bank parameters we were able to predict the levels of antimicrobial resistance in all 259 countries/territories and thereby create a global map of antimicrobial resistance. 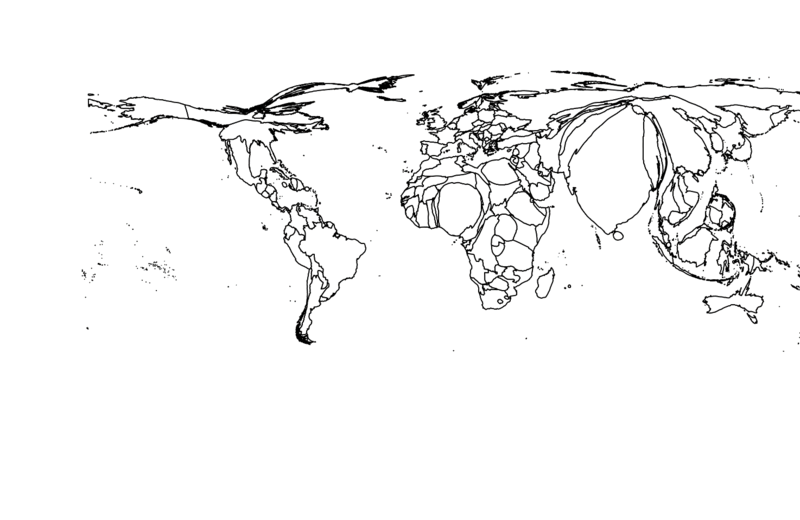 Distorted map according to population size and predicted antimicrobial resistance prevalence. Our study provides novel insight into the abundance and diversity of antimicrobial resistance genes around the World and to the best of my knowledge the first predicted map of antimicrobial resistance. The study is published today in Nature Communications. However, this is only a pilot study and we have conducted additional sampling in collaboration with our global partners in the Global Sewage Surveillance Project (www.compare-europe.eu/Library/Global-Sewage-Surveillance-Project). In addition, the metagenomics data generated can also be analyzed for addition findings such as pathogens (bacteria, parasites, virus), human population, bacterial composition, etc. Thus, in the future human sewage collected and analyzed with the data shared in real-time might become a continuous way of doing global surveillance and detecting (re-) emerging pathogens. I sincerely hope the global research community will find these data interesting and useful for additional datamining and will visit, interact and collaborate with us at: www.globalsurveillance.eu. Petersen TN et al. Meta-genomic analysis of toilet waste from long distance flights; a step towards global surveillance of infectious diseases and antimicrobial resistance. Sci Rep. 2015;5:11444. Munk P et al. Abundance and diversity of the faecal resistome in slaughter pigs and broilers in nine European countries. Nat Microbiol. 2018;3:898-908. Hjelmsø MH et al. Metagenomic analysis of viruses in toilet waste from long distance flights-A new procedure for global infectious disease surveillance. PLoS One. 2019;14:e0210368.